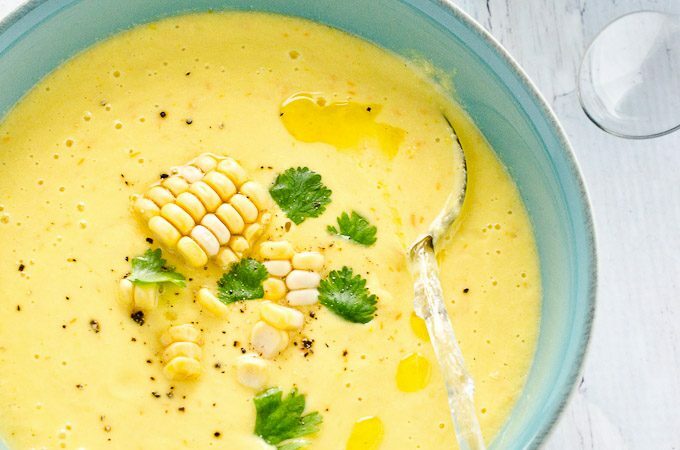 Sweet corn gazpacho, or any gazpacho for that matter, may just be the single best summer food ever created. It's been my obsession this summer, and I wanted to share that obsession with you. Again. I know that just a few weeks ago I shared with you a recipe for Ugly Tomato Green Gazpacho, and now here I am again with more gazpacho. 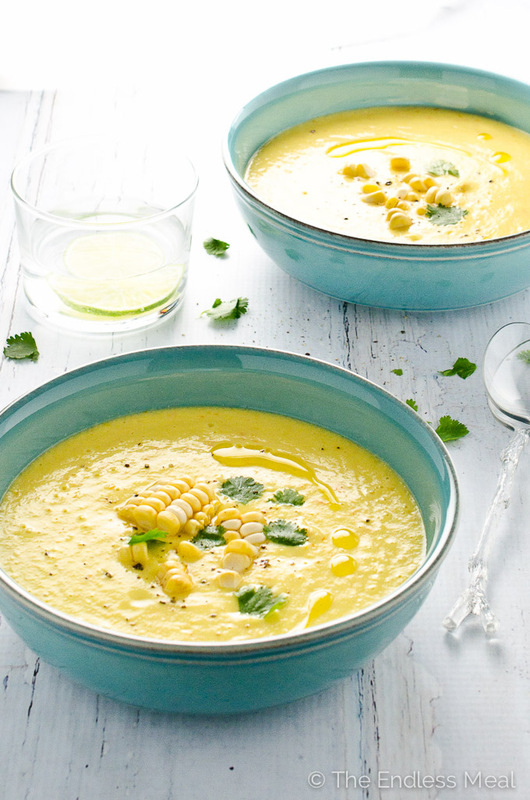 Sweet corn gazpacho this time, so you know, totally different. The truth is that my fridge has had some variation of gazpacho in it each and every day since June. No lie. I just can't get enough! It's cold, which is a very good thing on a hot summer day. You don't have to cook it, also very good on a hot summer day. It gives you a great excuse to use some of summer's incredible veggies. It's refreshing and just hits the spot. It's a super healthy bowl full of veggies that tastes amazing. It's crazy easy to make. It's creamy yet 100% dairy-free. You can make a big batch and eat it for days. Yum! It's corn. Any who doesn't love corn. ? I have to tell you guys, I'm feeling a bit funny writing this post. I typically write a post and share it with you all on the same day. Sure, I usually develop the recipes and take the pictures in advance, but never the writing. For some reason, it feels too disconnected to write something and then let it sit for a while. I mean, what if I tell you a story about something that happened to me today, but then I don't share it with you for weeks? That would be weird. I want to tell you how excited I am to go on holiday. Like, a real holiday. A 100% gadget-free holiday. The last time we were at the cabin I had no cell or internet service. Even if I want to, I won't be able to obsessively check my Instagram feed. Like, at all. I'm kind of nervous that I'm going to go through withdrawals, but excited too. See … this is getting weird. I'm telling you how excited I'll but when you read this I won't be excited cause I'll already be here. I hope you guys can forgive this lapse of rational communication. Until I return … Happy sweet corn gazpacho eating! 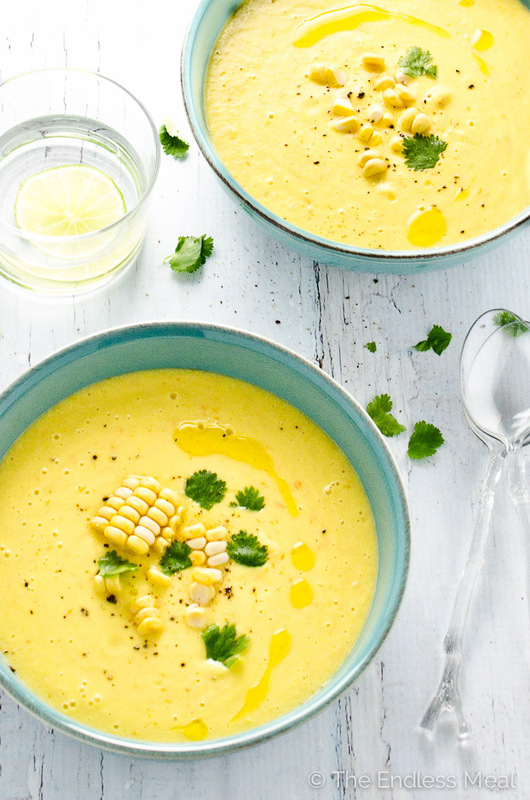 If you make this Sweet Corn Gazpacho, make sure you snap a pic and tag @theendlessmeal on Instagram. I love seeing the recipes you make from The Endless Meal! 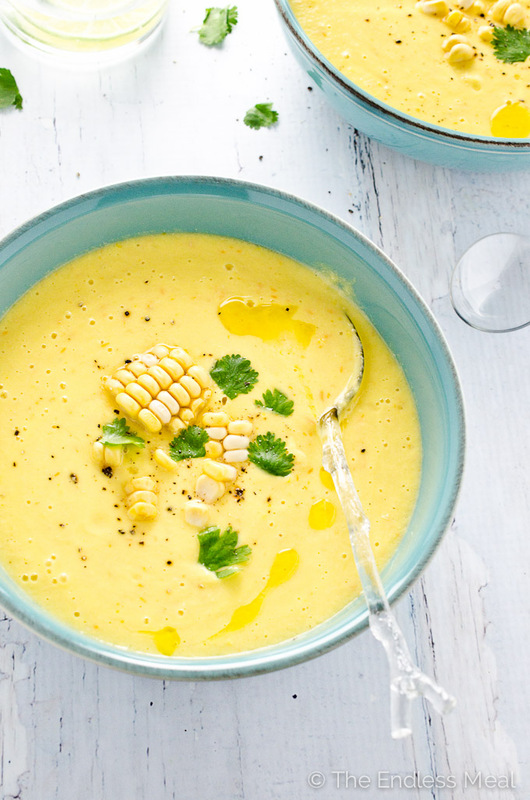 This beautiful corn gazpacho is made with fresh, sweet summer corn. It's a chilled, creamy soup that is 100% dairy-free and so perfect on a hot day. Stir through the sherry vinegar and lime juice then season to taste with sea salt. This soup can be made up to 3 days in advance. Keep it covered in your fridge until you are ready to serve it. There was nothing “sweet” about this soup. The tomatoes overwhelmed the corn flavor and then the vinegar completely took over. I only put a splash of vinegar initially after reading another experience, but it was still too much. I cut the vinegar with LOTS of sugar and a touch of white pepper. It tasted okay, by after sitting in the fridge all night—-welcome back vinegar. I love vinegar, but that’s the only flavor that came through in the end. I ended up not even taking this soup to the luncheon where I had planned to serve it. Not at all what Inwas expecting. Very disappointed. I’m sorry to hear you didn’t love the soup. I found the bell pepper, onion, and tomato overrode the corn flavor after my first blend, so I took a bunch of those veggies out for the second. When I blended the two blend-batches, it came out great! The olive oil really smoothes out the flavor, too, and the lime is a nice touch for an added pop! Thank you! So happy to hear you found a balance that worked for you! I was going to post a quick comment about how you should use only half of the sherry vinegar and then add more if you think it needs it, but I then realized there is a true tale of woe in making this recipe that I wanted to share. I ended up losing my phone at the store. Retraced all my steps, asked lost and found – no phone. Retraced my steps, waited for 15 minutes for a customer to stop talking to the manager so I could ask him to check lost and found again – no phone. Drive home, figuring out plan B on how to get a new phone on a Sunday night if I do not find mine (it involves a 2 hour trip each way). Check the computer, it says my phone is on the highway near the store. I fear someone has stolen my phone. Walk to my neighbor’s to borrow her phone – she’s not home. Walk to another neighbor’s and she is home, but she is chatty and i get mauled by her 110# dog’s sharp claws when he jumps on me. I use her phone to call the store – they say they have found it! Spend more time talking with my chatty neighbor, then leave. I am covered in dog hair and I hate dogs already. Back to my car, drive to the store, retrieve my phone, pay for my groceries. It turns out I have spent $20 on heirloom tomatoes. When I finally get home, I have spent 3 hours on my “quick trip” to the store. I finish making the soup. I am hungry and excited to taste it and….. all I can taste is vinegar. I add more salt, more olive oil, cilantro – to no avail. I cannot taste the corn at all; the vinegar pervades everything. I finally pour myself a bowl and add some mozzarella balls to it in desperation to cut the vinegar taste – it doesn’t work. I eat the soup out of obligation, not because it is good. So, this truly was an endless meal for me – one that took a 3 hour shopping trip, getting mauled by a dog and covered in dog hair, chatting with my chatty neighbor when I didn’t want to, spending way too much on tomatoes – all for a soup that was not good. I wish I would have gone easy on the sherry vinegar and just wanted to warn others. I’m off to take a bath…. I’m so sorry the recipe didn’t turn out well for you. And for the adventure you had to go through! I can’t think of a reason why the vinegar taste was so overpowering. The sherry vinegar I buy has a fairly mild flavor, as far as vinegars go. Maybe yours was stronger? Making this tonight for our “soup group”!! 🙂 Can’t wait to give it a shot. It does look amazing, and I have an abundance of cilantro out in the garden. Perfect. Awesome! I hope you love it as much as I do!! I was on vacation and was given a sample shot of corn gazpacho. It was wonderful! (…but I’m sure not healthy like your’s..) I can’t wait to make this! Really quick though – What if I can’t find yellow tomatoes?? TIA! Any color of tomatoes will work … they’ll just change the color of the gazpacho but the flavor will still be great! i might be crazy, but i dont know if you cook the corn or not. can you let me know? Just made the yellow gespacho. It is delicious!! Although i didnt have lime nor sherry vinegar. I used lesser quantities of lemon juice and balsamic vinegar instead. It is still so good, . Thank you. That’s right, the nutritional info is for 1 cup. Sorry for the confusion! Wow this looks so good! I haven’t had a good corn gazpacho in forever. Thanks for reminding me to make this again, can’t wait to try your recipe!! Oh my gosh, YUM! And I love that there isn’t any cream! I made this last night, with corn and yellow peppers from my CSA and yellow roma tomatoes from the Greenmarket. I was a little dubious about how it was going to turn out, I confess, but OH MAN this is seriously delicious and really, really easy. Thank you! In my book, soup is one of the most challenging thing to shoot ever, and you’ve perfectly nailed it! It’s one of the most handsome Gazpacho I’ve ever seen. Look at this color and little air bubbles on the top:) Plus, I’ve never had corn Gazpacho before, and the idea sounds fantastic! Thank you so much for the compliments! I totally agree, soup can be super tough to shoot … It’s so hard to make it have any depth. You really should try corn gazpacho. It’s so sweet and delicious! YUMMM I need this asap! sounds and looks so goood! 😉 and love the clear spoons too! Thanks, Michele! I actually won the clear spoons from Kitchen Daily when they were having a Twitter contest and I retweeted something. I never win anything so it was totally exciting! This sounds fantastic Kristen! We always have sweet corn in the summer this would be a great way to use it! I love corn, and raw is fantastic! I just want to caution people about GMO. A HUGE percentage of corn grown in North America is GMO. Bad news. Something like 95%. So source your corn wisely. Thank you, Kristen! Your blog is my daily go-to. I so agree with you about GMO corn (or GMO anything for that matter). I’m so lucky to have non-GMO corn grown quite close to where I live that I forget that other people might not have access to the same quality of food. Good warning! ooooooh I love gazpacho! Looks delicious. Enjoy your vacation! Oh my… Kristen! This looks and sounds incredible! 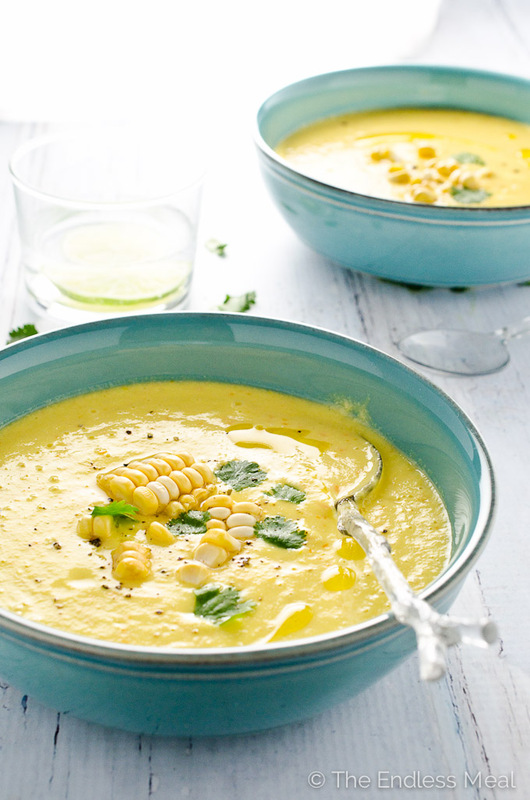 I never would have thought about making a sweet corn gazpacho, but it makes total sense! I love coming to your site because each recipe is so creative, so fresh, and always inspiring! Oh hell ya! Grilled scallops on this would be amazing!! The color is what’s drawing me! So beautiful! I can’t get enough of our fresh summer Jersey corn…soo good! Summer corn really is the best, isn’t it?! !